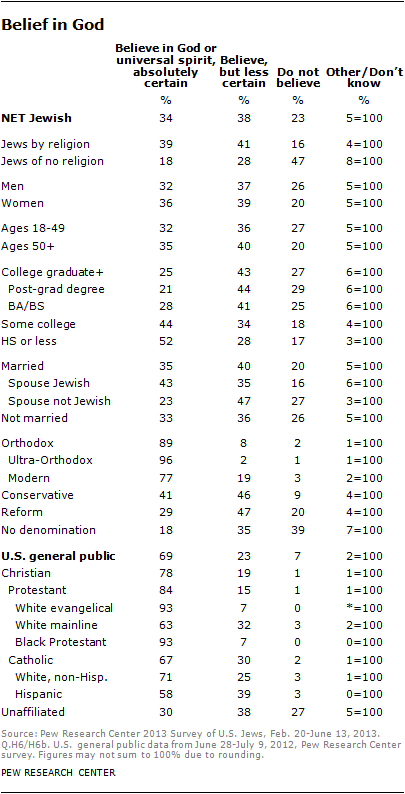 On a variety of measures, Jews are less religious than the general public. For example, roughly one-quarter of Jews say religion is very important in their lives, compared with more than half of Americans overall. Similarly, a quarter of Jews say they attend religious services at least once or twice a month, compared with 50% among the general population. A key exception to this pattern is Orthodox Jews, whose level of religious commitment matches or exceeds most other religious groups in the population. Though many Jews say religion is not a very important part of their lives, participation in Jewish traditions remains quite common. Seven-in-ten Jews say they participated in a Seder last Passover, for instance. And over half of Jews – including about one-in-five Jews of no religion – say they fasted for all or part of Yom Kippur in 2012. The data also make clear that American Jews have a broad view of their identities; being Jewish is as much about ethnicity and culture as it is about religious belief and practice. And many Jews defy easy categorization. Some Jews by religion are non-believers, while some Jews of no religion are ritually observant. Though Jewish identity is correlated with religious observance (Jews by religion are substantially more observant than Jews of no religion), the correspondence is not perfect. A slim majority of U.S. Jews say religion is very important (26%) or somewhat important (29%) in their lives. On this measure, Jews exhibit lower levels of religious commitment than the U.S. general public, among whom 56% say religion is very important in their lives and an additional 23% say it is somewhat important. However, the fact that many Jews say religion is relatively unimportant in their lives does not mean that being Jewish is unimportant to them; as described in Chapter 3, eight-in-ten Jews say being Jewish is either very important (46%) or somewhat important (34%) in their lives. Among Americans who are Jewish by religion, two-thirds (66%) say religion is very or somewhat important in their lives. Far fewer Jews of no religion say religion is very (8%) or somewhat (9%) important to them. Religion is somewhat more important to Jewish women than to Jewish men. And religion is more important in the lives of Jews with a high school education or less than among Jews with a college degree. Orthodox Jews stand out sharply on this measure as compared with other Jews. About eight-in-ten Orthodox Jews say religion is very important to them, which is on par with white evangelical Protestants (86%) and black Protestants (89%). Among Conservative Jews, 43% say religion is very important to them. Fewer than one-in-five Reform Jews (16%) and fewer than one-in-ten Jews with no denominational affiliation (8%) say religion is very important in their lives. 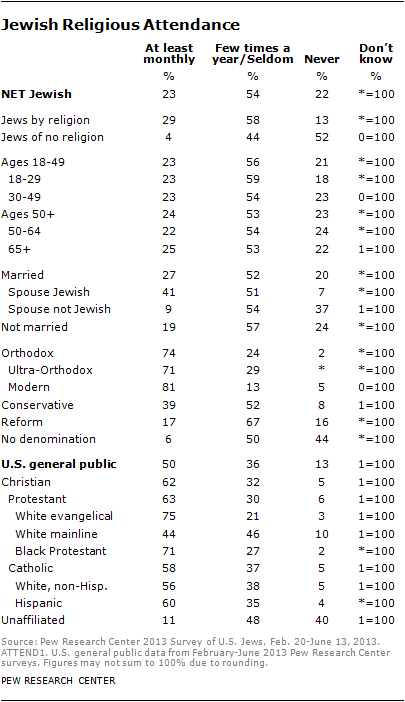 Three-quarters of married Jews who have a Jewish spouse say religion is very (42%) or somewhat (33%) important to them. Far fewer intermarried Jews say religion is a key part of their lives. Seven-in-ten U.S. Jews believe in God or a universal spirit (72%), including one-third (34%) who say they are “absolutely certain” about this belief. Eight-in-ten Jews by religion say they believe in God or a universal spirit, including 39% who are absolutely certain about this belief. Among Jews of no religion, 45% believe in God with 18% saying they are absolutely convinced of God’s existence. Most Jews see no conflict between being Jewish and not believing in God; two-thirds say that a person can be Jewish even if he or she does not believe in God, as discussed in Chapter 3. 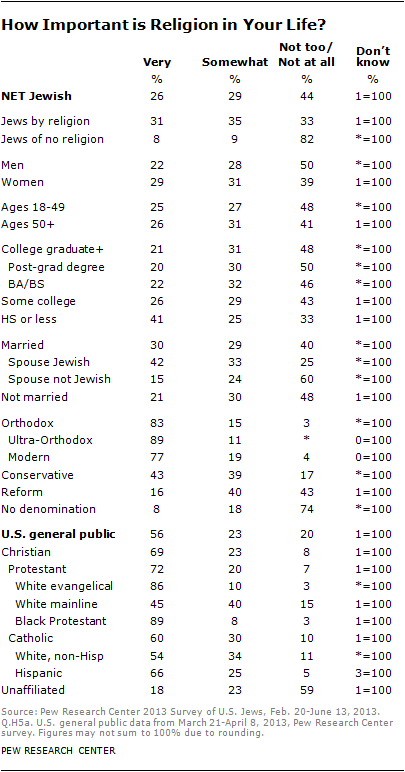 Belief in God is much more common among the general public than among Jews. Even among Jews by religion, belief in God is less common than among members of other major U.S. religious groups. And Jews of no religion are more skeptical of God’s existence than is the religiously unaffiliated general public. Though most Jews express some doubt about God’s existence, certainty about God is nearly universal among Orthodox Jews, 89% of whom say they are absolutely convinced of God’s existence. Far fewer Jews from other denominational backgrounds share this level of conviction. Nearly one-in-four U.S. Jewish adults say they attend Jewish religious services at a synagogue or other place of worship at least once a week (11%) or once or twice a month (12%). Roughly one-third of Jews (35%) say they attend religious services a few times a year, such as for the High Holidays (including Rosh Hashana and Yom Kippur). 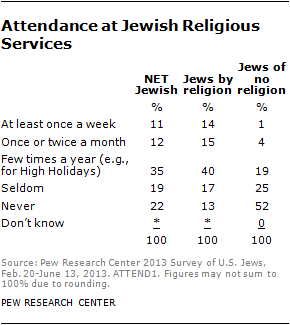 And four-in-ten say they seldom (19%) or never (22%) attend Jewish religious services. Attendance at Jewish religious services is much more common among Jews by religion than among Jews of no religion, half of whom say they never attend religious services (52%). Jews report attending religious services at much lower rates than do other religious groups. Six-in-ten Christians (62%) say they attend religious services at least once or twice a month (compared with 29% of Jews by religion). Orthodox Jews, however, say they attend religious services at least as often as the most religiously committed Christian groups. Roughly three-quarters of Orthodox Jews (74%) say they attend religious services at least monthly, on par with white evangelical Protestants (75%) and black Protestants (71%). Married Jewish respondents who have a Jewish spouse attend Jewish religious services much more frequently than do intermarried Jews. Four-in-ten of those who are married to a Jewish spouse (41%) say they attend religious services at least monthly, and just 7% say they never attend religious services. Among Jews married to a non-Jew, these figures are reversed (9% say they attend religious services at least monthly, and 37% say they never attend Jewish religious services). Many Jews, even those with no religious affiliation, engage in a variety of traditional Jewish practices. Seven-in-ten (70%), for example, say they participated last year in a Seder, a communal meal commemorating the beginning of the Passover holiday. Even among Jews of no religion, four-in-ten (42%) say they participated in a Seder. Participating in a Seder appears to be slightly less common today than it was a decade ago. The 2000-2001 National Jewish Population Survey asked a similar question and found that 78% of Jews reported participating in a Seder during the previous year. Attending a Seder is more common among Orthodox Jews (99%) than among members of other denominations. And it is more common among Jews married to other Jews (91%) than among intermarried Jews (54%). More than nine-in-ten Orthodox Jews report having fasted on Yom Kippur in 2012, as do three-quarters of Conservative Jews and 56% of Reform Jews. A quarter of Jews with no denominational affiliation say they fasted on Yom Kippur in 2012. Regularly lighting candles to mark the start of the Sabbath is less common among Jews than participating in a Seder or fasting on Yom Kippur, as is keeping a kosher home. Nearly a quarter of Jews (23%) say they always or usually light Sabbath candles (down slightly from 28% in the 2000-2001 NJPS), and a similar number say they keep kosher in their home (22%). As with other traditional practices, Orthodox Jews are much more likely than other Jews to say they regularly light Sabbath candles and keep kosher homes. Similarly, Jews married to a Jewish spouse perform these activities at much higher rates than intermarried Jews. One-in-seven Jews say they avoid handling money on the Sabbath (13%). However, most Orthodox Jews continue to maintain this traditional Sabbath observance. About a third of Jews (32%) say they had a Christmas tree in their home last year, including 27% of Jews by religion and 51% of Jews of no religion. Erecting a Christmas tree is especially common among Jews who are married to non-Jews; 71% of this group says they put up a tree last year. Compared with younger Jews, those 65 and older are somewhat less likely to have had a Christmas tree last year. And relatively few Orthodox Jews, including just 1% of Ultra-Orthodox Jews, say there was a Christmas tree in their home last year. Attending non-Jewish religious services is an infrequent occurrence for U.S. Jews; just 15% say they do this at least a few times a year.